It's been the holiday/break of the year. I can't remember the last time I took such a long time off ... and worst of all it's been years since I've been back to the African continent. Although I'd never done it before I really wanted to see what the 90-odd kilometer's had in store and why most of the family had done it more than once. My father-in-law would be hiking it for the 11th time around and therefor a suitable candidate as our official guide. 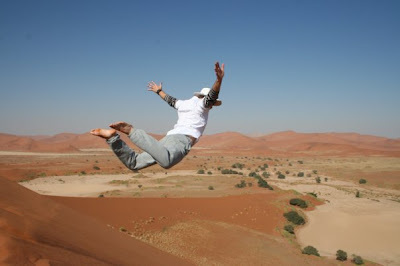 ... from hiking through the depths of Africa's largest canyon drinking water straight from the river, to standing on top of sand-dunes in the blistering sun looking down over ancient dried-up valleys.... and then jumping off!! Hope speak to you on the phone soon, and catch up on some chat. Looks amazing DC.. Deffo on my to-do-list.. Would love to get to see some more pics. Hope you got them back from ur crashed HD. Hoping to squeeze in a week-end trip to London before winter hits us. Would be ace to meet up.